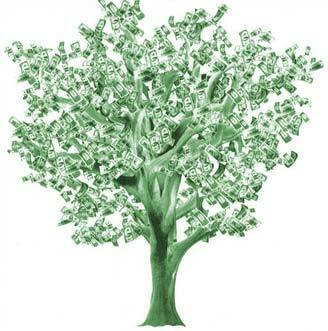 Are you neglecting your money tree? We are blessed here in America, because, for the most part, many people who live here or come to this country are given tremendous opportunities to become wealthy and flourish. In fact, our culture has changed so much to one of prosperity and entitlement that people even have the audacity to ignore money when it’s staring them in the face. People view money as something they want to earn, save, waste or spend on their own terms. Case in point? When was the last time you saw spare change on the ground and picked it up? I’ve known plenty of people that would rather walk past it then bend down and drop it in their pocket. In addition, I remember my brother who worked with a fellow who threw out pennies because he thought they didn’t add to much and weren’t worth keeping. What other ways have Americans become blase about money? How about our desire to purchase bottle water because tap water was no longer acceptable even if perfectly safe to consume? Or the fact that most people will drive a block or two and waste gas to find better parking simply because they’d rather not get a bit of exercise and walk instead? Don’t get me wrong; earning money to support your family, become wealthy, and using those monies to enrich your life is a good thing. But why is it when you suddenly have it, you feel compelled not to use money correctly or treat a dollar like a dollar? With that said, how are you using your money effectively? What are you doing to benefit others, your community and the economy with it?